It's not very often that I need to add hanging sleeves to my quilts. I know that I could easily make a sleeve with the same fabric as the backing, but, I find it easier to use Quilters Hangups. I am not compensated for this article, just a happy customer. The Hangups have a gusset on them that allows just about any size rod to be used. First I measure out the premade hanging sleeve and then cut it about 1" shorter than the width of my quilt. I then fold in the raw edges on each side about 1/2" and sew them down. 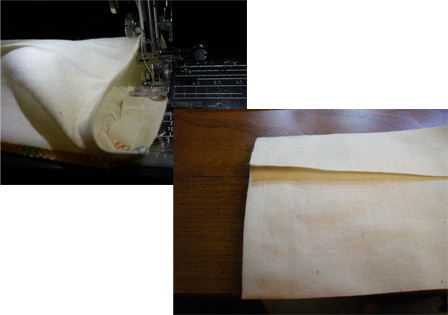 I sew from the inside of the seam on my machine and just slowly circulate the fabric until it is all sewn down. I then repress the sides. I like to put the gusset back in on the edges just sewn. On the non gusset side that has the multicolor surging seam, I add a 3.25 or 3 inch path of Steam A Seam 2. I have so much that I cut a length of the fusible to match the length of the hanging sleeve. I also cut the fusible thinner such as 2.5 inches and placed it in the middle. They both work. I lay it very carefully to make sure I have free edges on both sides to allow for stitching as well if I use the 3.25 inches. I then remove the second side of paper from the steam a seam and place the hanging sleeve even with the last border seam on the quilt. I check with a ruler from the edge to see if I'm straight. You need to be a couple inches or so down from the edge of your quilt because the gusset on the sleeve will appear above your quilt when hanging if you don't. Then I place the sleeve with the Steam a Seam 2 down on the quilt (make sure the gusset is on top) and iron away. Be careful, I've singed a few hanging sleeves being a little heavy on the iron. If done properly, the steam a seam holds very well. But, we all know any fusible web can be temperamental. One minute it's holding and then it's not. 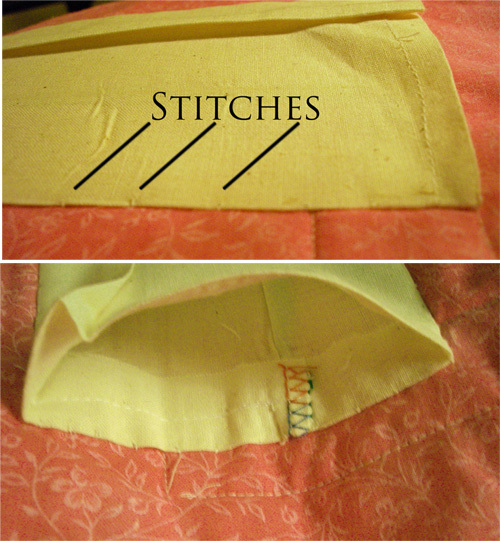 I add extra insurance by slip stitching the edges to the quilt like I do with binding. Having it already adhered to the quilt makes the stitching go very fast. Make sure you stitch around the right and left open edges. That way, the rod's won't accidentally try to squeeze behind the hanging sleeve. I'm sure someday I'll try making my own hanging sleeves. For now, this works for me when I rarely need to add hanging sleeves.